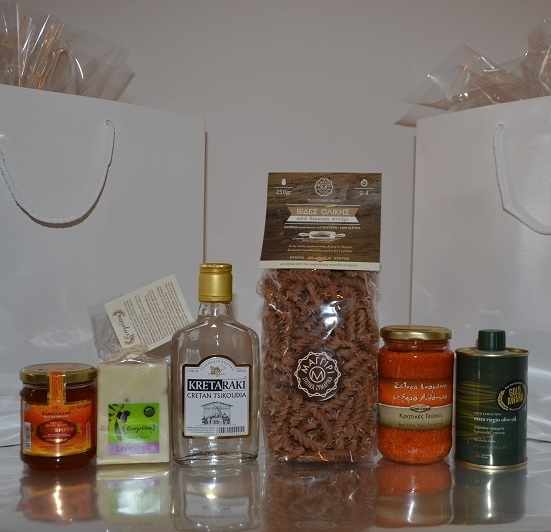 Gourmet and traditional Cretan products were selected to be given as gifts to the delegates of a congress hosted by a French multinational coorporation in Chersonisos, Crete. Charisma: Award winning extra virgin olive oil from the Vassilakis Estate in Neapoli. Evergetikon: Olive oil soap with orange and lavender extract. As dictated by the organizing committee, during the selection of the gifts we focused on the excellent quality and variety of the Cretan products, while they favored the more cost effective solution of a gift bag instead of a box. All the selected products were efficiently packed together and placed in white, good quality bags. It turned out to be an economic but very elegant gift packaging. The French delegates who received the gift bags were enthralled by the proucts, their fragances and flavours.